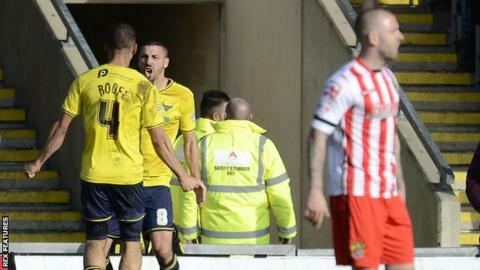 Relegation-threatened Stevenage grabbed a vital draw against 10-man Oxford. The second-placed U's were reduced to 10 men after just 16 minutes when John Lundstram was shown a straight red for a reckless challenge on Michael Tonge. Oxford skipper Liam Sercombe then had his second-half penalty saved after Jones manhandled Danny Hylton, but he made amends in the 58th minute with his 14th goal of the season. But Boro equalised when Byron Harrison fired home from Greg Luer's pass. Stevenage sit 22nd in the League Two table, seven points above the drop zone. Lundtsram's red card means the 22-year-old playmaker will now miss Oxford United's Johnstone's Paint Trophy final against Barnsley at Wembley on 3 April. Match ends, Oxford United 1, Stevenage 1. Second Half ends, Oxford United 1, Stevenage 1. Joe Skarz (Oxford United) wins a free kick in the defensive half. Corner, Stevenage. Conceded by Jake Wright. Substitution, Stevenage. Ryan Johnson replaces Dean Wells. Corner, Stevenage. Conceded by Danny Hylton. John Mullins (Oxford United) wins a free kick in the attacking half. Foul by George Waring (Oxford United). George Waring (Oxford United) wins a free kick in the defensive half. Hand ball by Liam Sercombe (Oxford United). Substitution, Stevenage. Tom Conlon replaces Bradley Pritchard. Bradley Pritchard (Stevenage) is shown the yellow card for a bad foul. Danny Hylton (Oxford United) wins a free kick in the attacking half. Goal! Oxford United 1, Stevenage 1. Byron Harrison (Stevenage) right footed shot from the left side of the box to the centre of the goal. Assisted by Greg Luer. Corner, Oxford United. Conceded by Byron Harrison. Corner, Oxford United. Conceded by Dale Gorman. Corner, Oxford United. Conceded by Jerome Okimo. Byron Harrison (Stevenage) wins a free kick in the defensive half. Goal! Oxford United 1, Stevenage 0. Liam Sercombe (Oxford United) left footed shot from the centre of the box to the centre of the goal. Assisted by Kemar Roofe. Delay in match Dean Parrett (Stevenage) because of an injury. Attempt missed. Greg Luer (Stevenage) right footed shot from the centre of the box is just a bit too high. Substitution, Oxford United. Josh Ruffels replaces Alexander MacDonald. Keith Keane (Stevenage) wins a free kick on the left wing.